Crispy, delicious, pepperoni pizza. 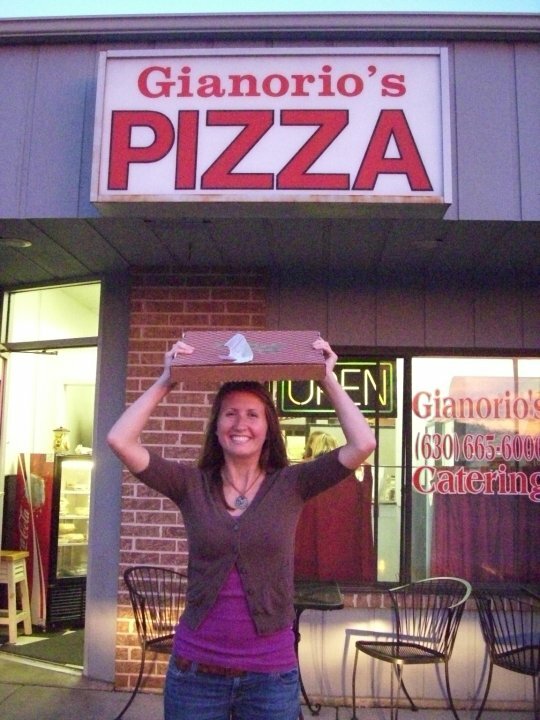 Pizza from the Gianorio's, the place down the street from my house in Illinois. We ordered there so often, they knew our name. I was last in northern IL in May for my brother's college graduation. We drove to good ole Wheaton to see friends and creepily drive by our old house. But mostly we wanted to get some pizza. Look at me. So triumphant. So joyous. Holding that box of steamy greasiness. Plans are still being worked out, but there's a good chance I'll be driving with the fam back to Chicagoland for Christmas. And if we do, you can be sure there will be pizza eaten. And I'll be triumphant and joyous once again.